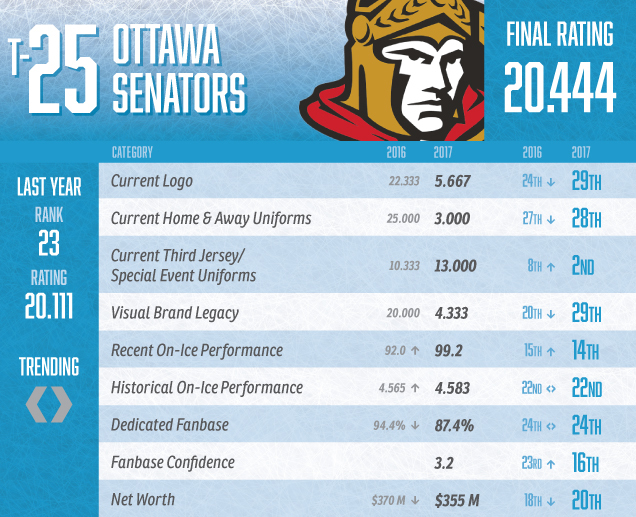 This is it, the definitive (and only) power rankings for NHL team brands. And it’s based on more than just a subjective opinion about each team – there’s actual math/science/statistics behind it. For those interested, I’ll outline how the rankings were calculated. Don’t care? Click here to jump right down to the ranking themselves. First, a little bit about branding. There’s a perception that a brand is nothing more than a collection of a team’s logos and uniforms, and I can’t overstate how wrong that is. That’s doesn’t even fully encompass just the visual brand of a team (a visual brand also includes things like marketing materials, ads, websites, season tickets, game programs, paraphernalia, etc, etc). It’s a common misunderstanding, which may get you blocked on Twitter if you point it out to some people (guess I don’t “get it”). So, what’s a brand? The simplest way to put it is: it’s nothing more than the public’s perception of an organization (or team, in this case). While the visual brand is certainly an element of that, the overall brand includes the team’s performance, their fan’s confidence in them, their ticket sales, etc. 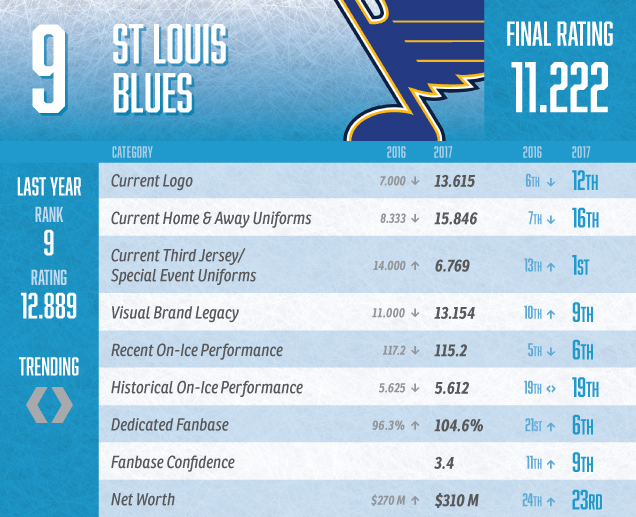 If a team has a lousy season, it negatively affects their brand. If a team can’t get people into the arenas, it negatively affects their brand. If a team has a massive and engaged fan base, it positively affects their brand. 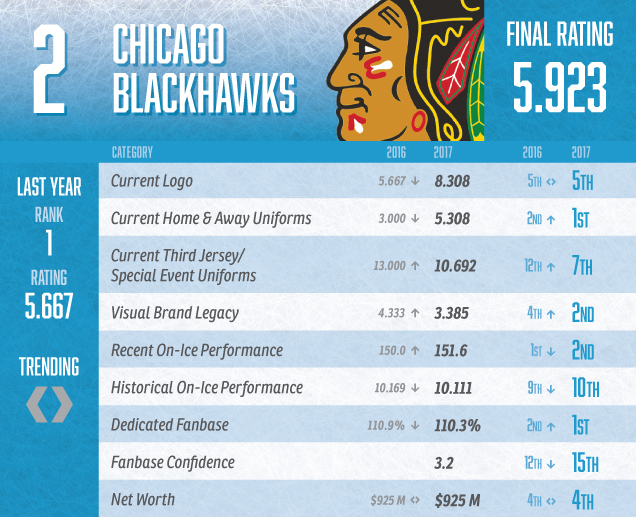 If a team wins the Stanley Cup, that has a definite positive effect on their brand. What that means is that while the team does have a certain amount of control over how the public perceives their team, there is inherently a lack of control as well. Fans not trusting an organization’s direction, for example, is beyond their control. In hockey specifically, a bad PDO (aka puck luck) or injuries can affect a brand. A team’s previous successes (or lack thereof) – which the current management had no part of – definitely affects a brand. The point is, a brand is constantly in flux. Every touch point between the organization and the public can affect how the public perceives the organization. So, the team tries to control as much as possible every aspect of their brand that they can, to positively influence the public’s perception of them on a continuous basis. And that’s where brand strategy comes in. Boston, for example, brands the type of hockey they play and that comes out in their visual brand as well – aggressive, gritty and truculent. They find players that fit that brand, for better or worse, and it guides the entire organization. All this is to say that a team’s brand is much, much more than just the logo and uniforms. But they do play a large part, because it’s the most visual representation of an organization and the easiest way to show the direction of a brand. All this is to say, there’s many different elements to a brand. For these power rankings, we’ve selected nine specifically, and here’s what they are and how they’re decided. Four of the categories are taken up with the visual brand. 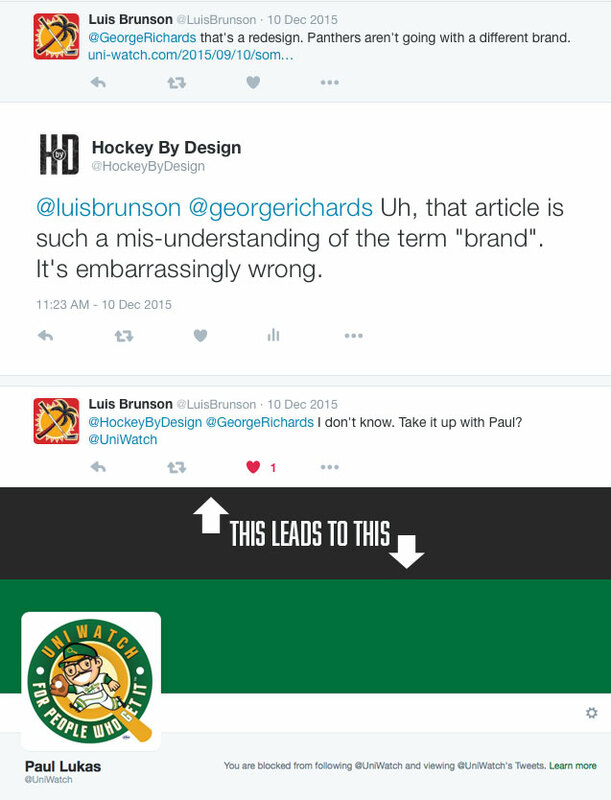 And again, this is not just my subjective opinion, but the combined opinion of over a dozen people – all of whom are professional designers and hockey fans, including luminaries such as Todd Radom. They all voted anonymously though, so we have no idea who voted for what, we just have the final compiled data, so don’t @ me…or them. In future rankings, we hope to include more designers in the process to get an even more precise ranking. If you’re a professional designer and want to be involved next time, definitely let us know. More than quadrupling the amount of input from professional designers had quite a bit of sway, as it eliminated more bias that’s implicit in any ranking of this sort. *Special event uniforms only from 2016-17 were included. If a team did not have either (a) a third jersey/uniform or (b) a special event uniform from 2016-17, all jerseys/uniforms than positively affected a team’s brand were ranked above these teams, and all jerseys/uniforms that negatively affected a team’s brand were ranked below. If you want to see which ones were included, you can click here. Of course on-ice performances affect a brand. Perpetual losers will be more-likely perceived as perpetual losers no matter how beautiful their logo and jerseys are. But like the visual brand categories, there’s current on-ice performances and historical on-ice performances. For example, a team like the Oilers haven’t made the playoffs in over a decade (negatively affecting the brand)…but they still have more Stanley Cups than 80% of the league (positively affecting the brand). 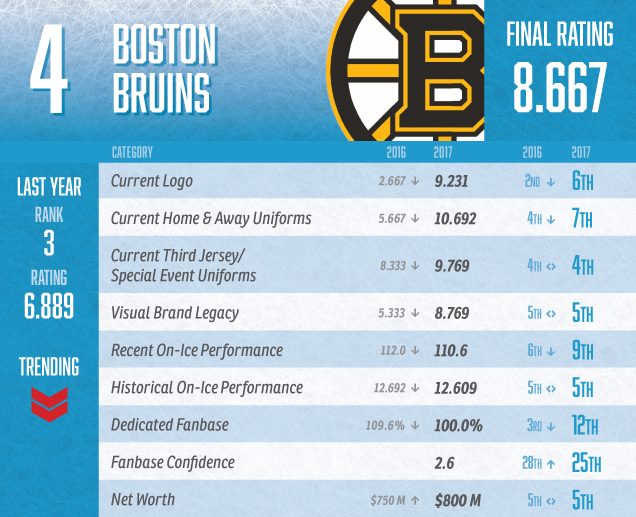 So, we created some formulas to figure out the best way to rank on-ice perfomance, and how that affects a brand. There’s two on-ice performance categories, and we’ll outline them both here. This category measures the last 5 seasons for each team. While 5 years is somewhat arbitrary, it’s generally how long a Cup win shine can last before fans start getting listless, and it’s generally how long a proper rebuild takes to start showing results, so it seemed like a logical number to use. First there’s the regular season, and the easiest and most obvious way to measure a team’s success is their point totals. For the playoffs, we used a weighted formula to measure a team’s playoff successes to somewhat correlate with point totals for the regular season. Making the playoffs meant your season total went up by 10 points. Winning one round meant 20 points. Winning two rounds meant 40 points. Getting to the Stanley Cup Finals means 60 points. Winning the Cup meant 100 points. For example, a 100 point regular season is considered a high benchmark, so the team that got the Cup gets that amount added on. But, the reason the points awarded diminishes faster after that is because it gets harder and harder to people to remember (and therefore, affect the overall brand) who made the Finals, or the Conference Finals, or even the playoffs. Then, these 5 seasons (regular + playoffs) are added together and averaged out, and then the 30 teams are ranked 1 through 30 based on that average. This one gets a little tricky, as you can’t really penalize teams for not existing as long as, say, the Original 6 teams. Sure, Montreal’s won 24 Cups, but they’ve also been around for 100+ years. And how much do you value winning the President’s Trophy (or being the regular season champion pre-President Trophy)? As much as President’s Trophies are scoffed at if there’s no playoff success that comes with it, it’s still a banner hanging in the rafters regardless. 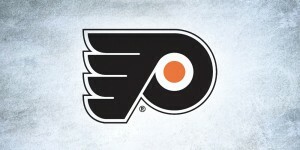 And so do Conference championships, so that’s included as well (as Stanley Cup Appearances, for pre-Conference years). Division championships also have rafter banners, but the history of divisions in the NHL is erratic, so it’s too difficult to take into account. If you know a way of doing this, let me know. Each team was given a “per season” ratio for each of these elements. For example, Montreal’s 24 Cups over 105 seasons gave them a rate of .2476 Cups/Season. Their 85 playoff appearances over 105 seasons gave them a rate of .8095 Playoff Appearances/Season, etc, etc. The “per season” ratio is then multiplied by the points for that element. Again, using Montreal, .2476 x 50 = 12.38. The total for all four elements are added together, and then the teams are ranked from 1 through 30. It should be noted that re-located franchises did not have their previous locations’ baggage carried around with them. 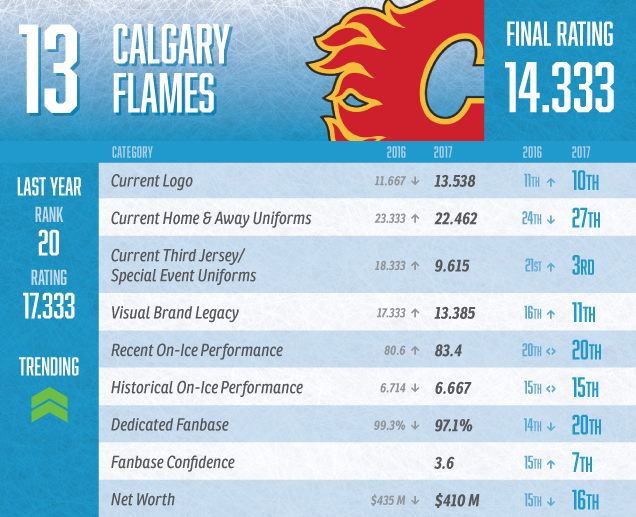 So, the Calgary Flames stats doesn’t include their years as the Atlanta Flames. New Jersey doesn’t include Kansas City or Colorado. Dallas doesn’t include Minnesota, etc, etc. In every case, this is to the franchise’s benefit, but it’s safe to say that a relocation is generally regarded as a fresh start for the franchise in every way, including branding. And Montreal’s stats do include their pre-NHL days. These categories are where I borrowed heavily from outside sources rather than using our own statistical methods to determine their rankings. I’ll explain each one individually. It’s a tough one to quantify. Using social media account followers, for example, would be skewed based on the population base of that team’s location. So, we needed something that was a percentage based metric and tends to wax and wane depending on a team’s performance, their physical location, and the dedication of their fans…ticket sales. Specifically, their arena capacity percentage over the 2016-17 season. I used the rankings compiled by ESPN based on information from the NHL. We used only the home arena statistics. Including the road arena statistics (or overall statistics) would tend to value high on-ice performance (that is, people showing up to only watch the good teams), and we’ve already covered that in the previous categories. 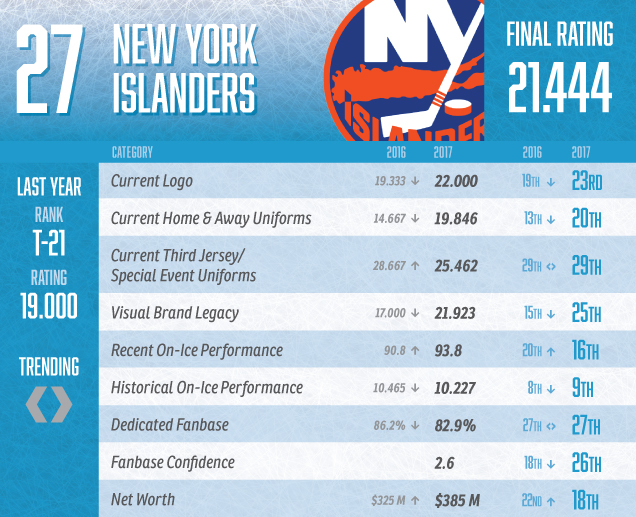 A few months back, Fanatics came up with a great study of the most loyal NHL fanbases that would’ve worked perfectly in this instance, as it took into account social media and jersey sales. 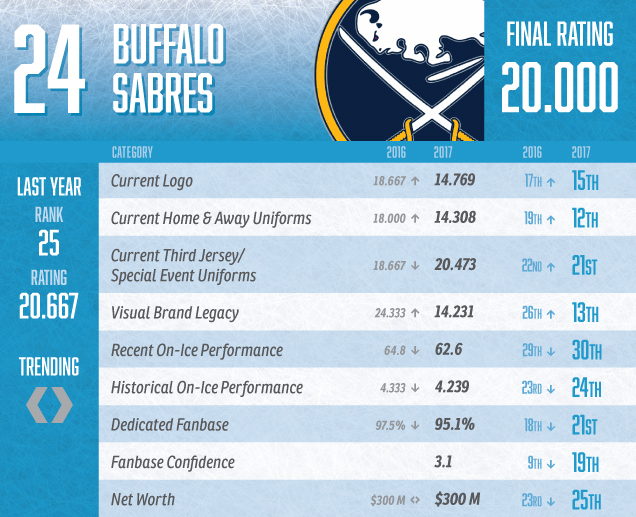 However, they only ever released the Top 10, probably to prevent an NHL-affliated organization from overtly shitting on NHL fanbases at the bottom of the list. It made the whole study useless for these rankings, so we’re sticking with attendance records. This is probably the category that is the closest to measure the core of a brand: the public’s perception of the organization. 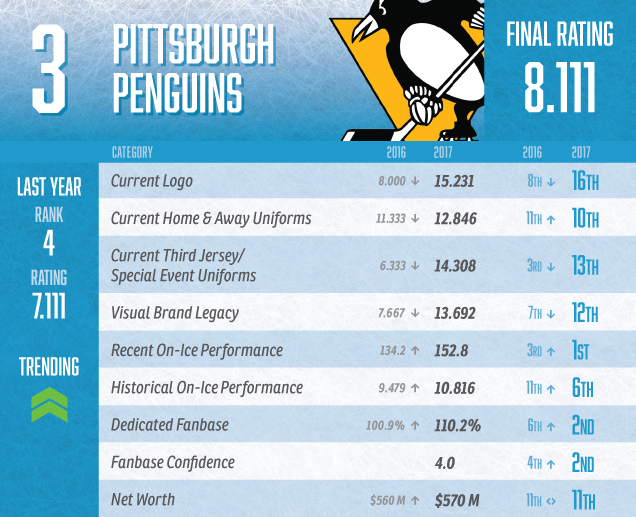 For this, we used the rankings from an article from the Hockey News back in July that used their own methodology to create their rankings of the confidence each fanbase has in their team. There’s an argument to be made that the more passionate fans are more likely to voice displeasure with their team, but that would theoretically be measured through the previous category. Also, they changed their system for their most recent rankings, so you’ll notice that each team’s 2016 rankings isn’t shown. The numbers were completely different, so comparing them would prove to be pointless. After all the other categories described, they’re not worth much if the franchise isn’t making any money. No matter what, an organization’s worth affects their brand. Every time Apple’s stock goes up or down, for example, it affects their brand. So we wanted to make sure this aspect of a brand was reflected. 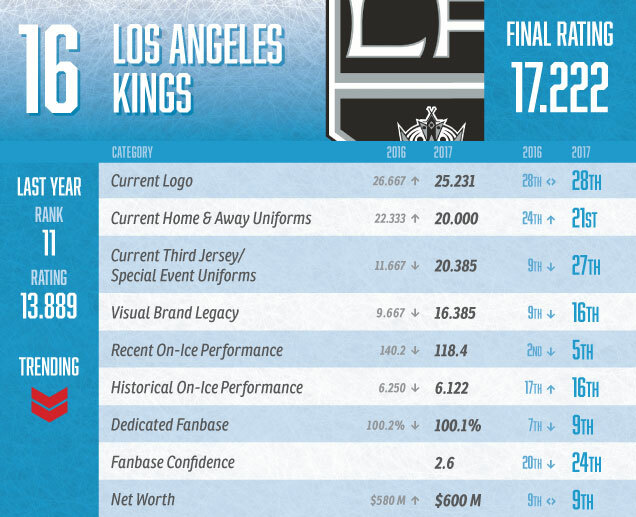 The most logical way to rank all the teams was to use the annual Forbes list of NHL franchise valuations, so we did. After each team was ranked 1–30 in each of the 9 categories, their rankings were added together and divided by 9 to get a final definitive ranking. So, the higher the number, the lower they are on the list. 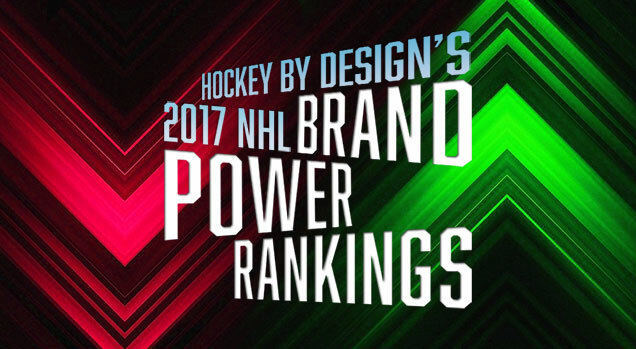 Now that you understand exactly how the process went, it’s time to unveil the definitive 2017 NHL Brand Power Rankings. Let’s get the question of the NHL’s 31st team out of the way. We included them in the Visual Brand categories of this ranking since that’s all been established at this point, but there was no possible way to include them in the On-Ice or Off-Ice Performance aspects of these rankings, as 10 or so games isn’t really a great sample size at this point and/or the data doesn’t exist yet. So, they’re officially unranked. But, we thought we’d still show you where they would’ve been ranked on their Visual Brand categories, though the remaining teams are still ranked 1–30 though (i.e. not 1–31). They’ll be ranked next year. 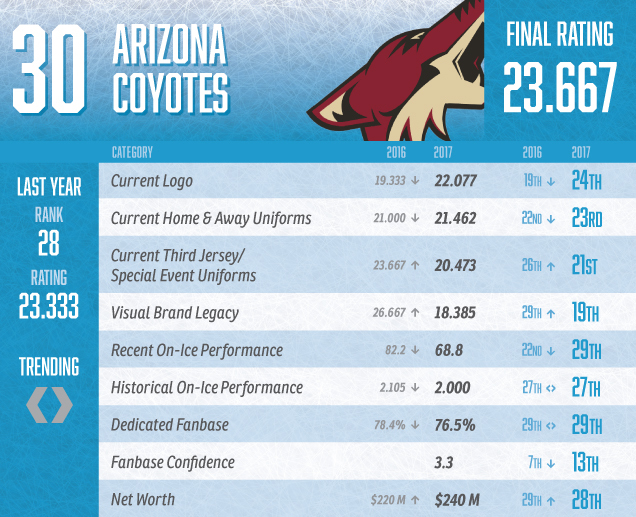 The Coyotes drop to last place on this list, and their performance so far this year doesn’t make it look like they’ll be climbing anytime soon. Their trip to the Western Finals is well in the rear-view mirror now, which helped precipitate this drop, but no fans, less confidence and a not-great visual brand doesn’t help either. Carolina stays put at 29th, and remains the lowest team to have won a Stanley Cup. There’s no question their new Adidas uniforms helped them jump up in that category, but they’re still at the bottom of the league in fanbase support and net worth. Stringing together a few seasons in the playoffs will help, but they’ve been stalled in that position for years now. 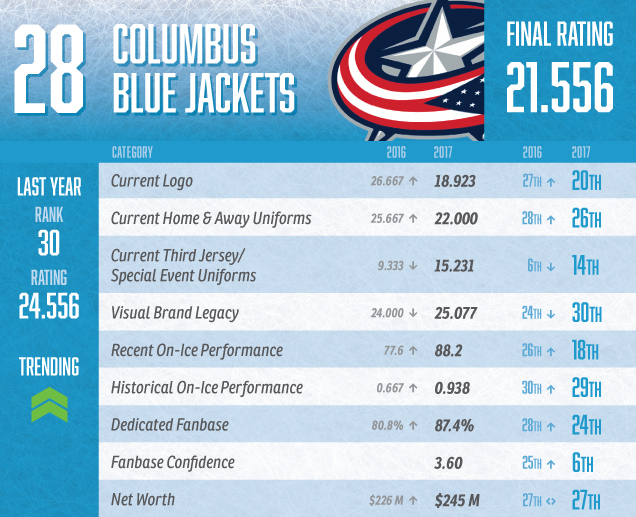 Columbus climbs out of the basement with their impressive 2016–17 season, which – aside from a couple aspects of their visual brand – have jumped them up in almost every category. Still, the visual side of their brand decidedly needs some love. And Torts isn’t gonna do anything about that. The second Stanley Cup winning team to appear are the Islanders, seeming stuck in being a bubble team that can’t make any significant progress. They’re even slipping with their historical performance, with the powerhouse team of the ’80s fading further from the distance, even if their jerseys look a lot more like them now. The problem is the abhorrent jerseys in-between (and those thirds, which hopefully will never see the light of day again). 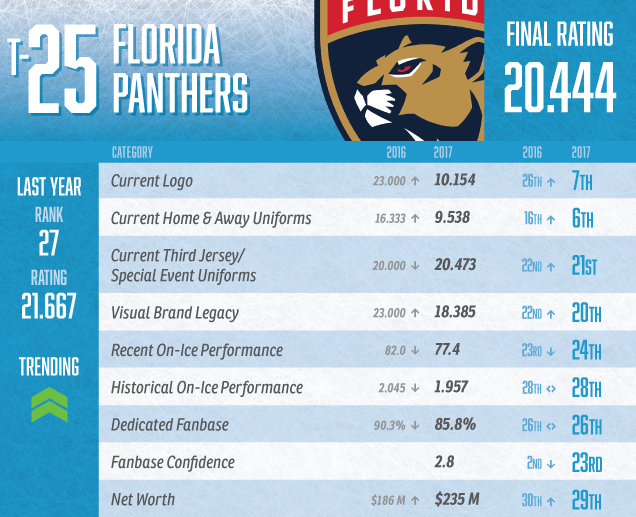 As predicted last year, Florida made a big jump up these rankings from a visual brand perspective, moving up a whopping 19 spots in the logo category. But, they couldn’t carryover a great 2015–16 season into last season, so they barely moved elsewhere…except for a massive drop in their fanbases’ confidence in the front office. For the second year in a row, Ottawa is the first Canadian team to appear, despite a surprising run to the Eastern Finals last year. Their final rating barely moved, but they dropped in the rankings from other teams passing them by. More seasons like the last one will help, but them not taking the opportunity to ditch their current jerseys for their awesome historical third jerseys from last year – which is what we here at HbD said they should do – absolutely killed them. The Sabres still can’t win, and their fanbase is getting restless. They did jump up in all the visual brand aspects, which helped move them up a spot, but until things improve on the ice (and they slipped to last spot in the Recent Performance category), this brand will have a hard time climbing much higher. And it’s nice to see that the general design community has apparently forgiven the Buffaslug and bizarro third jerseys from a couple seasons ago. Another Canadian team joins the list, dropping a whopping 7 spots from last year, most of it from balancing out the biases of our own HbD crew’s rankings of their visual brand from last year. And that’s on me, specifically (Go Canucks!). But, no Cups, a horrible season last year, and not much hope for the near future certainly doesn’t help things along either. 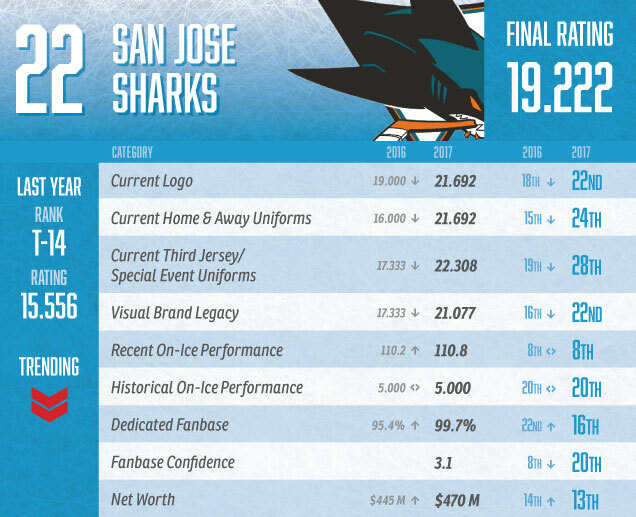 The first California team joins the rankings, and like the Canucks, the Sharks suffered hugely from more input from professional designers, dropping the brand in every visual category. Everything else is pretty much a wash, with the Sharks not moving the needle with last year’s season on the ice, and the confidence of their fanbase is slipping. It’s feeling like the Sharks are a brand entering a large transition. 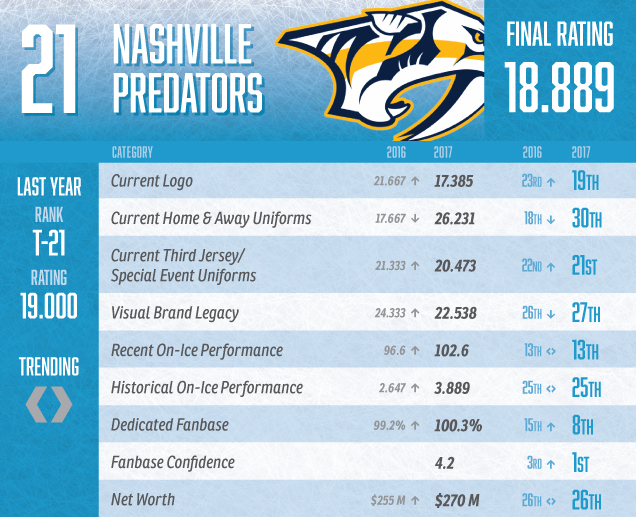 The Predators, despite last year’s run to the Finals, doesn’t move very much in the rankings. The fanbase is supportive and they have the highest confidence level in the league, but damn, that new horrendous jersey set hurt them. Hard. They officially now have the worst jerseys in the entire league, according to the group we surveyed (including ourselves). And it’s hard to feel good about a brand when it just doesn’t look good. Another team that took a big tumble was Washington, newly crowned as having the worst logo in the league (despite having what could be an awesome logo – the Weagle – at their disposal). But the Caps have always had trouble with the visual side of their brand, and their inability to get past the second round in recent years doesn’t help. Neither does a fanbase growing impatient and restless, dropping 17 spots in the Confidence category. The Devils are hurt by their recent string of bad seasons. Their Cup run from a few seasons just exited the Recent On-Ice Performance window, create a big drop as they’ve done nothing much since. Otherwise, with modest rises and falls in the other categories, nothing much else has changed, including their spot on this list from last year. That new jersey set didn’t really move the needle very much either. One of the biggest winners from the Adidas jersey takeover was Colorado, and this ranking certainly proves it. 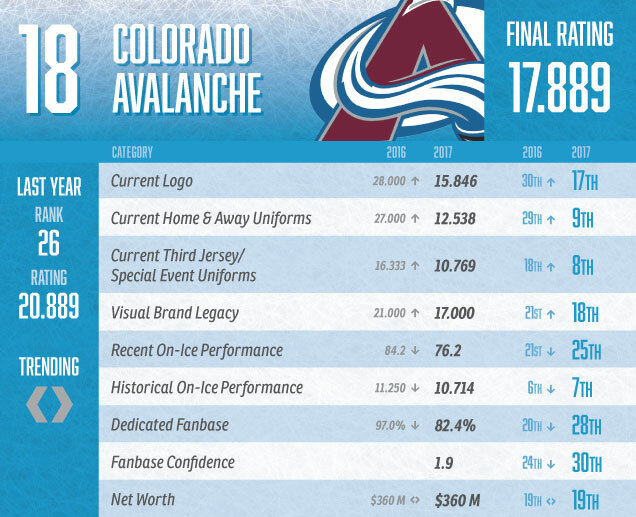 The Avs jump from second-last spot to the Top 10 for their new (see: old) jersey set. 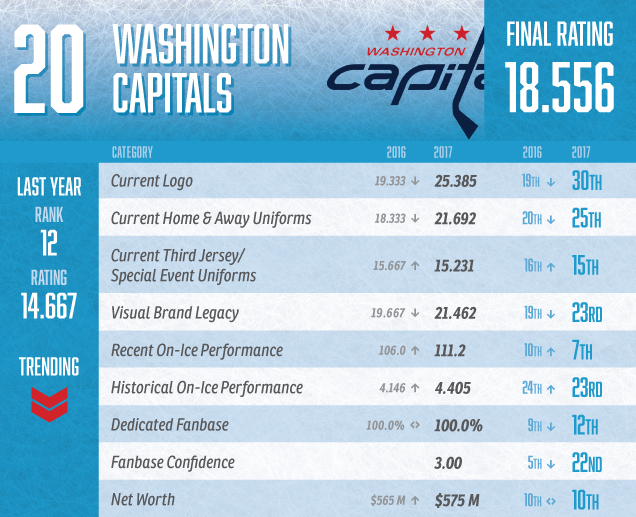 And it appears we undervalued their logo last year. It’s an impressive 8-spot jump for a brand that’s dragging along an historically awful year last year, as well as zero confidence that the team can turn it around any time soon. Their powerhouse teams from the ’90s and ’00s are keeping them elevated for now. 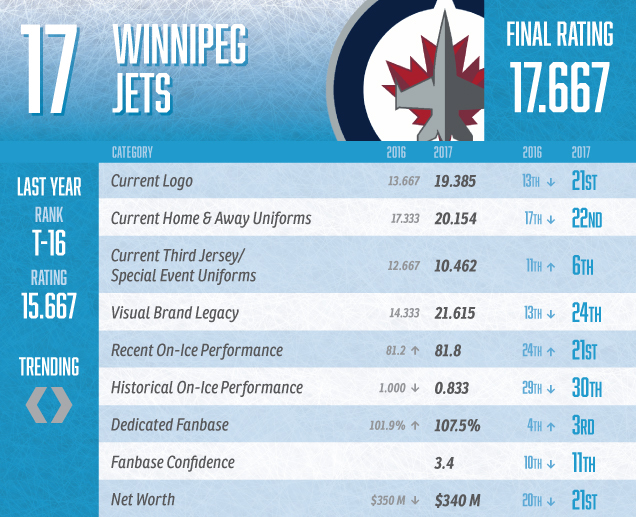 The Jets lost a couple points in the their final rating, but are lucky that didn’t really hurt their rank much at all. 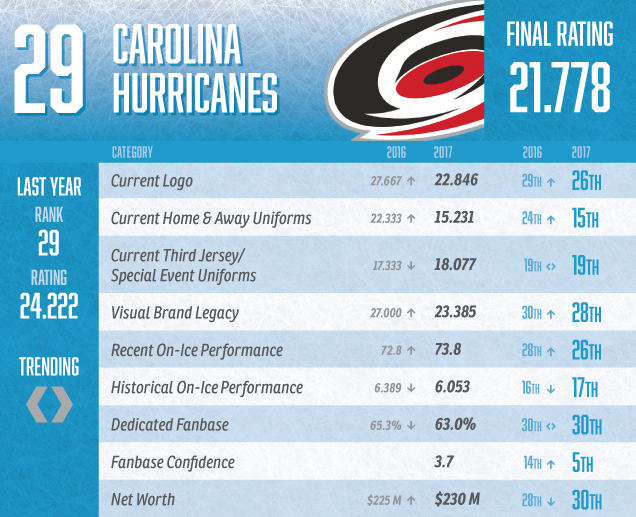 They now occupy last spot in the Historical Performance category (zero playoff wins will do that), and their visual brands took a hit with the additional input from other designers. There’s hope for the future, but it’s hard to say how up (or down) they be carried at this point. Yes, but what have you done for me lately? The effect of two recent Cup wins are lessening as time wears on. 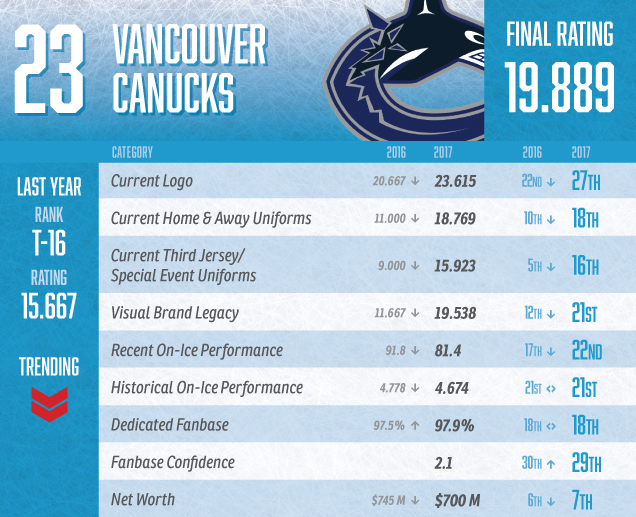 Add to that a bad logo, a generally awful “celebratory” grey jersey last year, having less playoff victories than the Canucks in the last three seasons, and a fanbase losing confidence in the future of this franchise, and you have a recipe for a drop. Can they turn it around? Maybe. A rethinking of the visual side of the brand would definitely help. But it doesn’t appears that’s going to arrive anytime soon. 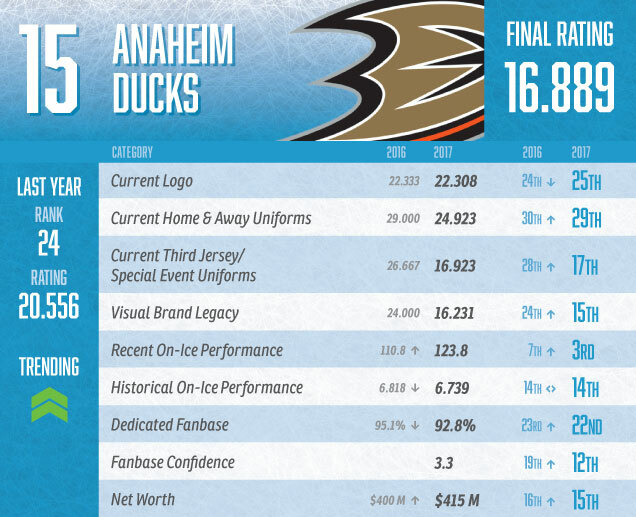 The Ducks make a huge 9-spot jump thanks 5 solid years of being one of the best teams in the West, as well as the design community being bigger fans of the old Disney-inspired look than we at HbD generally are. Their logo and jerseys are still awful and desperately need some love, but if they keep winning the Pacific and beating up on Calgary, their fans will be happy, confident, and forgive the dreadful orange/beige combo. 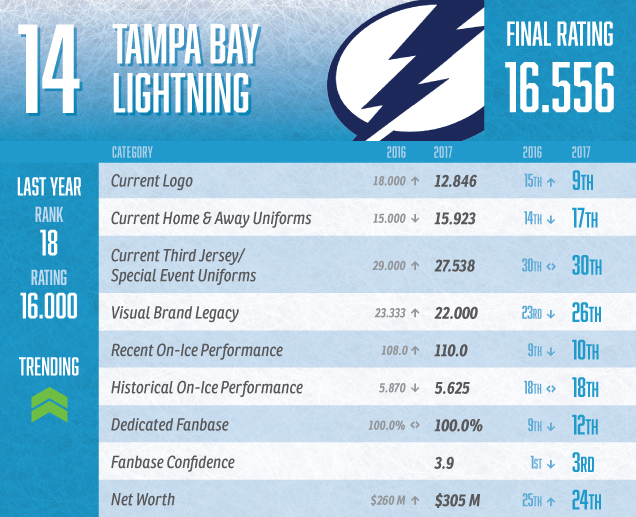 The Lightning’s unexpectedly bad season last year didn’t damage their ranking that much. What hurts is the legacy of truly horrific logos and jerseys that have scarred this brand since its inception until their most recent logo/jersey refresh. The fanbase is still incredibly confident (as they should be), and if the early part of this season is any indication, they’ll be continuing to climb these rankings. Let’s just hope those “Bolts” third jerseys will never see the light of day again. The Flames make a big jump here, moving up 7 spots. It’s helped by ditching their cowboy-inspired third jerseys in favour of historical ones. Honestly, those should’ve just become their full-time jerseys because their current ones are still awful and destroying a classic logo. The fanbase has hope, and as long as they keep making the playoffs (and avoiding the Ducks in said playoffs), they’ll keep inching upwards. 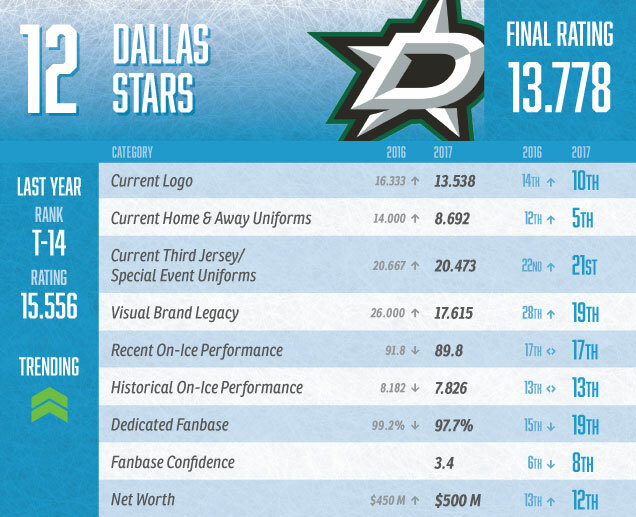 It appears we’ve officially forgiven the Stars for the uterus jersey, with their Brand Legacy pushing them up a couple spots in the rankings. A much stronger visual brand than they’ve ever had before also helps a lot too. The rest of the categories didn’t really move that much – some up slightly, some down slightly – but it seems like a fanbase that still has confidence that things are looking for the franchise, and the brand, as a whole. 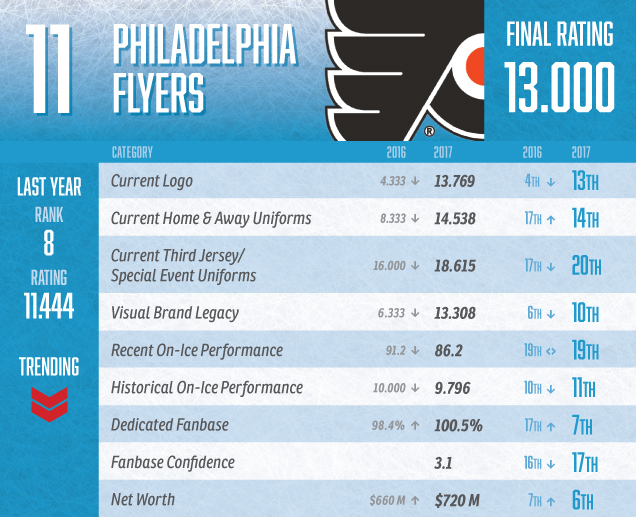 The Flyers took a big hit in their visual brand categories when getting more input from professional designers. I don’t agree with these rankings personally, but if that’s the consensus, then who am I to judge? The rest of the categories didn’t see much movement at all, and it might be a while before the Flyers see much gains in the on-ice performances, especially given the incredibly competitive division they’re in. 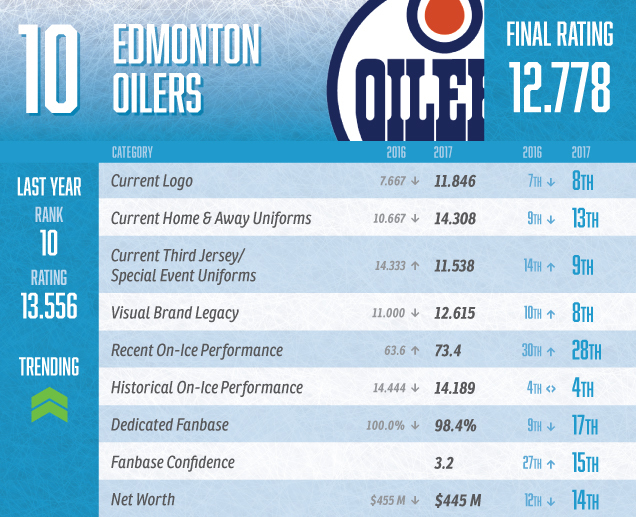 Edmonton didn’t see much movement in any of their categories, aside from having an awesome third jersey last year (jumping 5 spots), and then turning it into a lesser jersey this year (dropping 4 spots). Finally ending years of ineptitude and making the playoffs paid dividends for their brand though, climbing out of the basement in that category, and the fanbase is suddenly more confident too. It’s amazing what can happen when you believe in (Mc)Jesus. 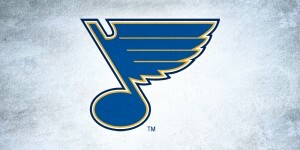 St Louis, like Philadelphia, took a beating from the additional input for the design community at large, dropping their logo and jerseys from near-the-top to middle-of-the-pack. What helped keep that wound from hurting them though was those fantastic Winter Classic jerseys. Aside from a jump in attendance, not much else made much movement overall. Minnesota was one of two teams (foreshadowing!) 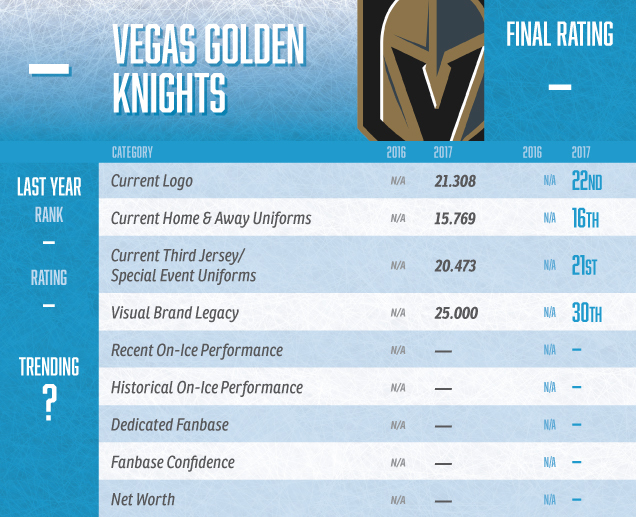 that benefitted the most from the additional input from more professional designers, moving 3 of their visual design categories up dramatically, including having the 4th-best logo in the league. 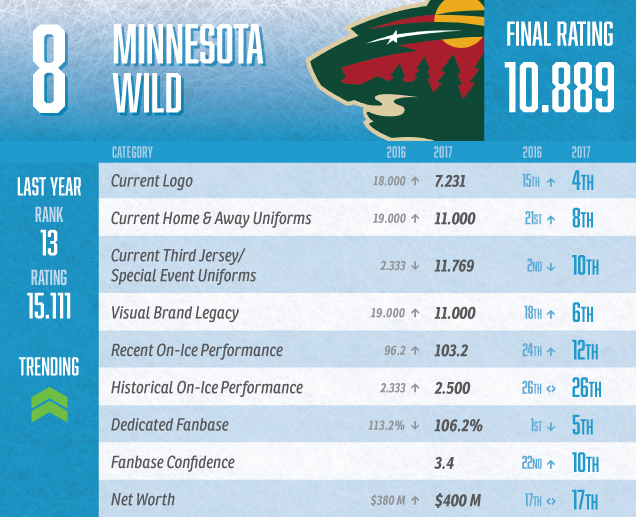 They weren’t as high on their third jerseys, but a good season last year and a confident (and dedicated) fanbase ensured that the Wild would only climb up these rankings. A long playoff run would definitely help them here too. 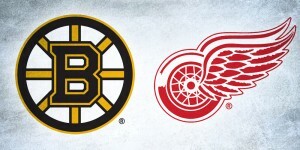 As like last year, the Original Six teams are dominant brands in the league – with history usually comes iconic legacy – and they take up 6 of the top 7 spots. 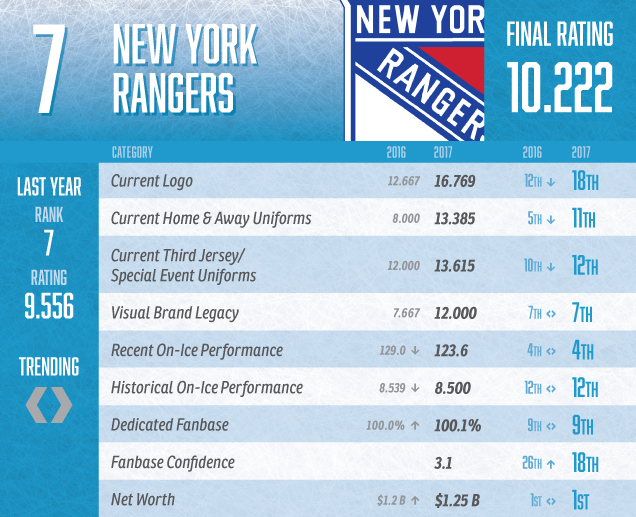 The Rangers’ net worth is miles above most of the majority of the league, and they’ve had a couple good runs lately. The fanbase is more confident than last year that their strings of good seasons will continue, but they’re still easily the weakest of the Original Six teams. Their 25-season-long playoff streak was officially killed off, and the fanbase is not confident that’s going to change anytime soon. But, this is still one of the best visual brands, with one of the best logos and jersey sets in the league. Ditching their mediocre at best Stadium Series jerseys and then using those wonderful Centennial Classic jerseys certainly helped too. And with their history, it’s hard to see them moving anywhere, despite what looks to be an difficult on-ice rebuilding period. Montreal takes a massive hit because of going from one of the best Winter Classic jerseys last year to not having any specialty/third jerseys this past season. It might be a little bit unfair to drop them because of that, but it’s not a secret that the Habs are not risk-takers in the visual brand department. 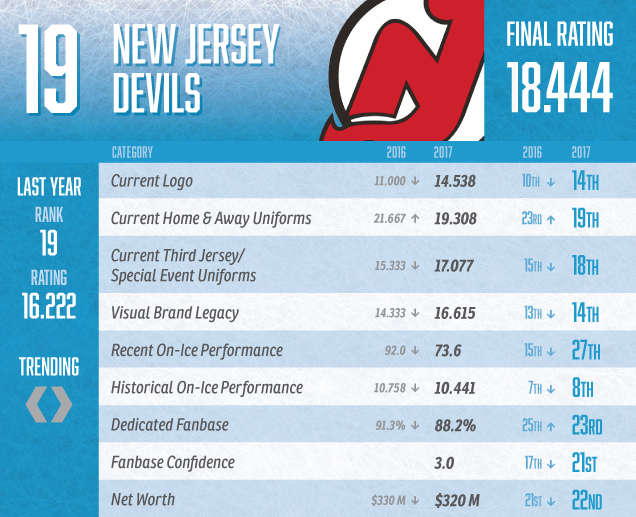 That can both help and hinder a brand (just look at New Jersey). But Montreal is nearly unbeatable in their legacy and completely untouchable in the historical performance, with 24 Cups to their name. What will make things shift is how their next few seasons play out. The fanbase is still concerned, but just slightly less so (although they’re showing up slightly less). Still, in every other category, the Bruins either went down or stayed the same. Their visual brand took a hit this year in a couple categories, but they still have a solid logo and a strong visual brand. The problem is their pattern of short playoff runs (when they make the playoffs) don’t help with the perception of the brand as a whole. The only non-Original 6 team in the top 7 spots has jumped up to third place on the strength of another Cup victory, which have a huge effect on both their recent and historical performance categories. The design community at large isn’t as bullish on their visual brand (and the Stadium Series jerseys didn’t help), but the fans are coming out to support, and they’re confident. And with all the chatter of a three-peat, who can argue with them? The Blackhawks get knocked off their perch of first place, partly because of some small adjustments from the confidence of their fanbase and their early playoff exits, but mostly because of the juggernaut that’s taken their spot on top. It’s hard to fault them for that, as they’ve been newly-crowned as the best jerseys in the league. Some things you just can’t control, and if you look at the ratings, there’s a big jump between 2nd and 3rd, so the ‘Hawks won’t be moving much in the future. It’s amazing what a single season can do. Give a rabid fanbase a competent management team, a little bit of success, throw in a franchise player, and you get a complete juggernaut of a brand. What surprised me was how much love there was for the visual brand amongst the professional designers that participated, as the Leafs claimed the spot of best logo in the league and the best visual brand legacy in the league. With the expectations of long playoff runs for the unforeseen future, their rating is only going to rise. They’re already at the top of the list, but it’s going to be extremely hard at this point to drag them down from that spot. 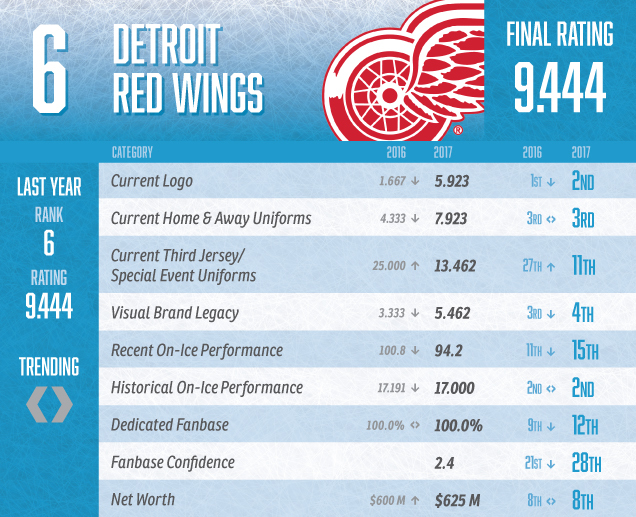 Outstanding post for me.Thanks for sharing whit us a great NHL Brand Power Rankings.